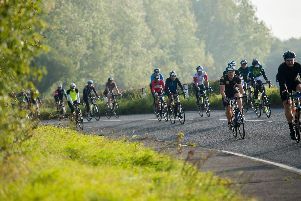 With all the controversy over the Velo South Cycle event, read what some people have to say about it. The idea of the Stop Velo South (SVS) protest group organising an alternative to the Velo South event, for 2019, is very appealing. I would strongly recommend that SVS sell their proposal to the 15,000 riders of Velo South, to attract them to the event, rather than antagonise them with attempts to have the event cancelled or disrupted. Clearly, any attempt to endanger participants would be likely to result in legal action against those responsible, only adding to the negativity. I can certainly understand the anger at the alleged lack of consultation, although I am aware of the huge efforts Velo South made to distribute leaflets and run a Road Show, but I am struggling to understand the true motivation of the protest group. the entire weekend. This means that, according to SVS, local businesses will be affected and residents will be ‘trapped’ in their homes, unless they hold it in someone else’s back yard. So that just leaves the commercial aspect. For the entrance fee, the organisers will incur a high level of cost just to manage an event of this scale. I have been told by Velo South that they will not make a profit on this inaugural event. Indeed, they hope to donate £2 million to charity. Also what does not seem to be considered is that a huge amount of money is being raised, by riders, for good causes. Sadly, because of a little disruption to their Sunday, SVS would deprive these good causes from receiving much needed money raised by these endurance cyclists and Velo South. It is disapponting for businesses that are negatively affected, although the Velo South website clearly shows businesses that are making the most of the event and details the help given to them. In many cases, I am sure that affected businesses could have done more to make use of the day, but I also appreciate that moaning and calling for compensation is a route requiring less effort. festivities. I have no connection with any organiser or sponsor, but am registered to ride in your beautiful region, with my son. We have two nights accomodation booked and will be spending money in restaurants and, hopefully, celebrating our achievement with a beer or two. Multiply that by 15,000 and your region is set to benefit financially. car, which is why Velo South have offered assistance where there are special needs. I sincerely hope that SVS is not limited to complaining and is capable of putting together an event that is so much better than Velo South – even though they don’t yet know what that benchmark is. I, for one, will support whatever they do – if it is professionally and safely executed. Unfortunately, my experience is that ‘walking the talk’ is much harder than simply complaining. I would be interested to read details of the plan, which, if they are holding it in 2019, should be well underway. Have they discussed it with the local councils? Have they got sponsors onboard? Have they planned a route that won’t effect any businesses or trap people in their homes? For those of you with a more tolerant nature, who wish to enjoy this spectacular day, I look forward to giving you a friendly wave. My neighbours and I first heard of the imposition that Velo South will have on our village of Pulborough was by way of an innocuous flyer through the door, hidden in junk mail, on 17 August. I have engaged in conversation with many neighbours and residents and I am alarmed that many have little or no comprehension how they will be affected. The A283 and A29 will be closed for five and a half hours. There will be no vehicle access to shops, Pulborough station or businesses along the route. Increasingly there is concern that this commercial CMS Velo South event has done little to engender good feeling towards cyclists and as forthcoming road closures become evident, I fear that the current antipathy will turn to anger and frustration towards the organisers CMS as they have failed to consult affected residents adequately. It’s not all pro Velo South here in the county, however rosy you paint the subject. The article in the Midhurst Observer infers that only five people have protested by way of a legal challenge to West Sussex County Council and CMS but there are very many more West Sussex residents who are supporting their cause. I have modestly contributed towards the legal fund to seek to stop the event. The Facebook group: Stop Velo South is gathering momentum. I suggest you heed these warning signs of malcontent. "There are two sides to the Velo South debate, one of which is in danger of being overlooked. It is clear that some residents of West Sussex feel that there has not been adequate consultation about the forthcoming Velo South. The entire event now seems to be threatened by the decision of five residents (that is not 500 or 5,000) to resort to legal action in defence of their inalienable right to drive their cars unhindered (maybe) during the maximum 12 hours some, but by no means all, of the road closures will apply. This argument sees fit to overlook the fact that, notwithstanding the road closures along the event route itself, there will still be access to and from the area bounded by the course as well as normal free movement of traffic within it. One does wonder why, if residents affected by the annual Prudential Ride London Surrey 100 have found ways of coping with road closures, West Sussex can’t. People managed somehow with road closures with even less notice when it snowed during the Beast from the East. That didn’t prompt legal action. The missing side is that The Observer could have presented a more balanced picture of the benefits of the event. Fifteen thousand cyclists of all abilities and from different parts of the country will be taking part. Many of these will be raising money for charity, as well as spending on food and accommodation in the county both before and after the event. This is money that would not have been raised, or spent, if the event had not been taking place. Charities and local businesses would not have benefited. Would that be ‘a good thing’? This ought to be an opportunity for West Sussex to showcase its attractions and encourage the event’s participants to come back again for longer visits. It would be a great shame if the message that is sent instead is that West Sussex is selfish and unfriendly, all for just 12 hours’ inconvenience." Professor Roger Cullis, of Hawksfold Lane West, Fernhurst, said businesses impacted should 'file a claim'. He wrote: "Like many others of your readers, my wife and I will be confined by the cycling jamboree on 23rd September. In our case, the road restrictions mean that we shall be unable to attend an adult grandson’s birthday celebration to which we were invited, because we cannot drive out of the lane in which we live. It is outrageous that, without prior consultation, West Sussex County Council should close public roads for which we all pay, to benefit a for-profit company. I hope that the Observer will publish the names of those councillors who voted in favour so that we may remember, when the next election comes around. Local businesses which incur extra expenses or lost profits may wish to file a claim at the Small Claims Court against the event’s organisers, CSM. Guidance on procedures and costs is set out in the following websites.